Morah Katie: Have you ever swung on a swing? Morah Katie: We are going to make something in class today. We took 2 chairs, string and metal nut. Morah Katie: What did we make? Jade: Something that kinda looks like a swing. Morah Katie: A swing is a pendulum, a pendulum is made by hanging an object from something else. Lochlan: A swing can break gravity, because it's hanging down and it's not on the ground so it won't hurt anybody. Morah Katie: It looks like swings break gravity, they hang down from the pole on top. Morah Katie: When you pull a pendulum to one side and let it go, what will happen? Ozzie: It will fall down. Matan: Gravity keeps everything down. Miles: Gravity pulls things down so they don't float. Morah Katie: What is going to make it move? Morah Katie: What will happen to the paint? Jade: It will drop down. Morah Katie: What was surprising about the pendulum painting? Colette: Watching the paint drop. Maya: The paint dropping, how it dropped, the pattern. Lochlan: It's because of gravity. If you let go it swings back and forth. Morah Katie: Would you like to demonstrate how gravity causes that to happen? We discovered that an object in motion will remain in motion until another force acts on it. We rolled a ball and it did not stop until it rolled into a the leg of a chair. It stopped for one moment and then went another direction. This led us to the idea of cause and effect. Morah Katie: Does gravity affect everything? Morah Katie: Morah Jillian will be running an experiment involving cause and effect and gravity with dominoes. Let's find out will happen when one domino gets knocked over. 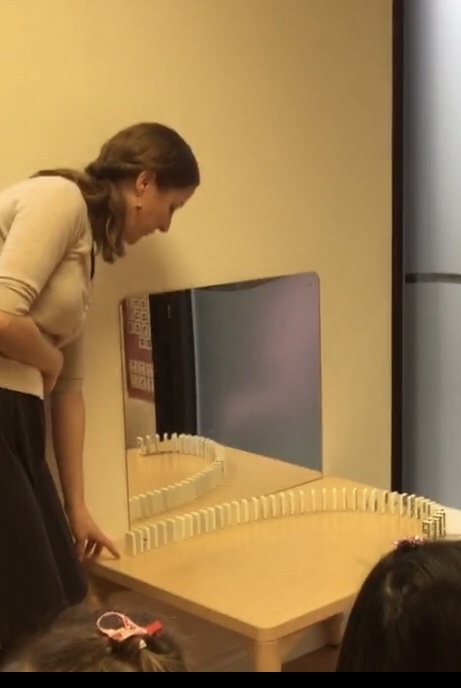 Morah Jillian: I lined up all these dominoes. What do you think will happen when I knock one over? Lochlan: They will all fall over. Lakshmi: I think so too. Morah Jillian: Just like that one domino impacted every other domino. It is just like when we treat our friends with kindness. We become like the dominoes once we start being kind to others they start being kind. That it is the domino effect with kindness.